Grace's A.M.B.E.R. 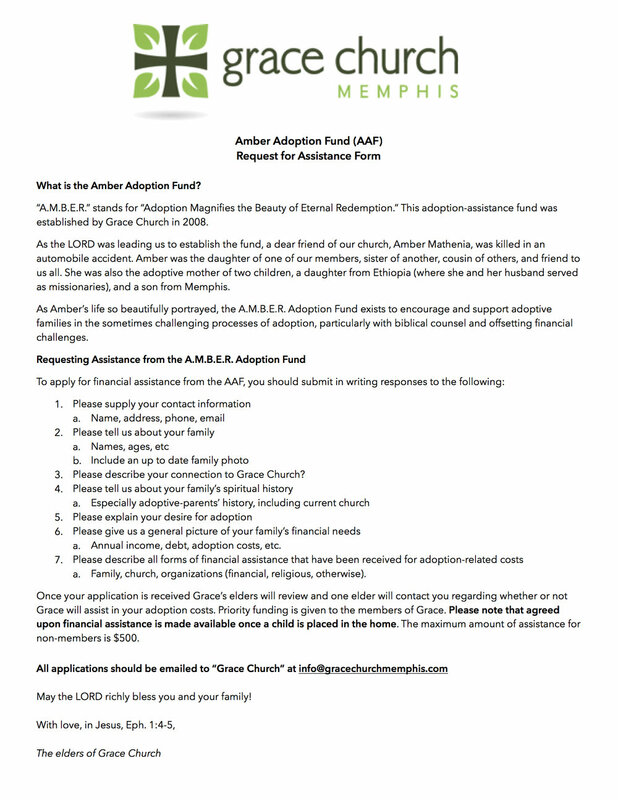 Adoption Fund exists to encourage Christian families to pursue adoption and to help with the sometimes burdening costs. AMBER stands for Adoption Magnifies the Beauty of Eternal Redemption, and is named in memory of the late Amber Mathenia, a wife and mother of two children, both adopted. Prior to her death (January, 2008), she and her husband were missionaries in Ethiopia. Several of Amber's family members, including her mother and sister are members of Grace Church. How Does the AMBER Fund Work? Priority is given to members of Grace Church, and then to believing families who embrace Grace's Member Affirmation of Faith. To apply, follow the AAF fund request guidelines. Grace's elders oversee the fund. Every Christian has been adopted, some twice. Several members of Grace Church responded to a 2010 National Orphan Care Sunday sermon by reading Russell Moore's book, Adopted for Life, and writing a short contribution for the booklet: A Primer on Spiritual & Physical Adoption: A Guide for Parent's & Churches. Represented in the authors are single men, single women, married couples without children, and married couples with children. We hope you find this short booklet helpful! We exist to glorify God by treasuring Jesus Christ and spreading His eternal joy.